Shawn Maestle is the Chair of Weston Hurd’s Appellate section. He focuses his practice in the areas of appellate, commercial and real estate, as well as estate planning and probate litigation. Shawn has handled several class action matters at both the trial and appellate level. These matters have involved investment broker fraud, lending and title practices, product liability as well as insurance coverage. Additionally, through his representation of developers, property owners and small businesses, he has significant experience in land use, zoning and general business matters. As the Appellant, Shawn has convinced the Ohio Supreme Court to accept jurisdiction to hear the merits of his clients’ appeals more than ten times since 2001. 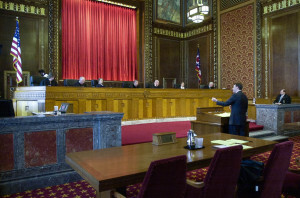 On February 20, 2013, the Ohio Supreme Court agreed to accept the appeal filed by Weston Hurd attorneys on behalf of Cincinnati Insurance Company in the matter of Spaeth v. State Auto Mut. Ins. Co., Case No. 2012-1866. to decide the following Proposition of Law: A Person Has Only One Domicile: Where the Person Resides and has the Intent to Remain Permanently and Return to When Away Temporarily (Sturgeon v. Korte, 34 Ohio St. 525 (1878), affirmed and restated). On October 14, 2014, the Supreme Court unanimously agreed with counsel’s argument, “We reiterate this court’s previous jurisprudence on the definition of domicile; it is where a person resides, where he intends to remain, and where he intends to return when away temporarily.